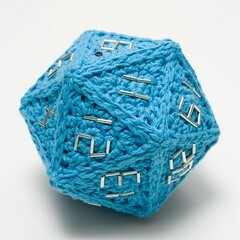 Everybody knows somebody who games, used to game, is married to a gamer (I know my husband is…oh wait we both are), what more could say “Happy Holiday” than a crocheted d20? Perfect for the new parent gamers, no worries about choking hazards or poked out eyes. Perfect for the cat lover gamer, ’cause you could fill it with some catnip to keep them off the dungeon map and chasing your other dice. Perfect cause, dang it…it’s just that cool. Harkens me back to the dayz when I crocheted a Spocky the Snowman! This lovely pattern was created by Ravelry member NeedleNoodles, and is available as a download on Ravelry for only $2.50. NeedleNoodles is also an Etsy Store so go look at the neat stuff there too! Com’on, you know you’ve paid more than that for dice before! 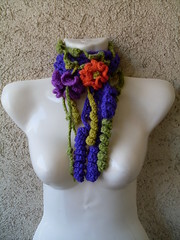 As I surfed through the CLF projects page on Ravelry.com I found this gorgeous free form scarf. One of the things I adore about free form crochet is being able to play with texture and color, and your imagination! How wonderful to be able to create beautiful flowers to adorn family and friends that have a certain je ne sais quois! CLF member Ethnicdesign created this gorgeous scarf which is for sale on Etsy. Stay tuned to this blog for more holiday crochet gifting ideas ;)! Ok, there is Amigurumi and then there is this! 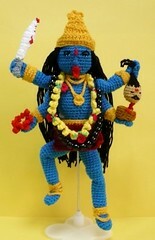 This is a fabulous crocheted representation of the Hindu Goddess Kali. As I was sorting through the many fabulous projects listed in the CLF’s projects, this one totally stood out! So much detail and attention paid to the representation of this Hindu diety. How could we award this anything else but the Hookalicious Award! CLF Member Melbangel created this fabulous crocheted goddess, and the pattern can be found at http://www.etsy.com/shop.php?user_id=87376 ! Melbangel, congratulations you and your crocheted creation have been awarded the CLF Hookalicious Award for outstanding crochet creativity! Call it a cozy, call it a bag, this is so darn cute! KAshmore pat yourself on the back! 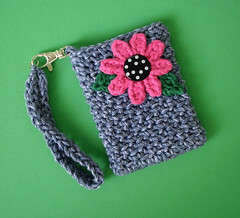 These bags have earned you the Kitschalicious Award for awesome crochet kitsch!